Cloud storage services for videos and photos are becoming more common. Why not make a cloud storage service part of your portfolio? 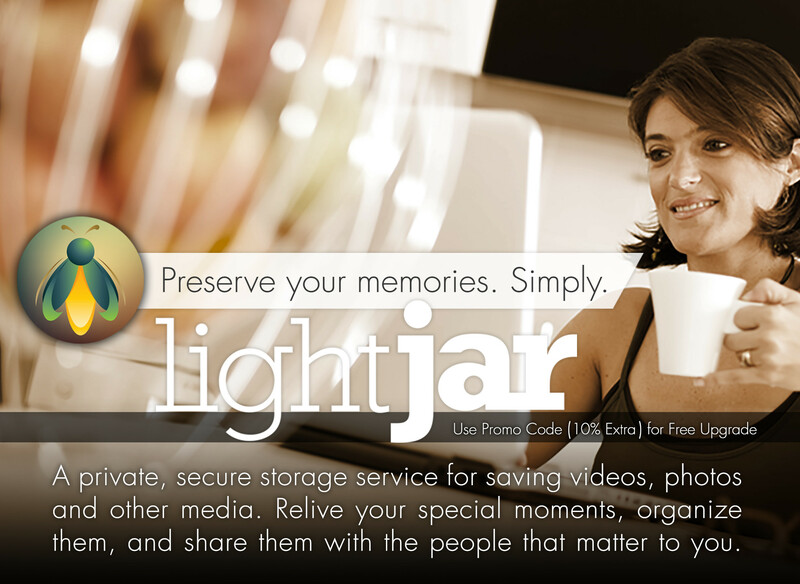 LightJar offers a private, secure means to save, organize, and share one's media recordings. It works with any device having a modern browser. For families, LightJar is simple memory protection. For businesses, LightJar can be an essential business tool for better collaboration and backup of important work. Potential Customers for LightJar - would be any consumer or business interested in a Cloud solution for saving their media recordings. Benefits of a good, cloud storage solution are: 24x7 access from anywhere via the Internet - secure and encrypted and private - easy collaboration and sharing - relatively inexpensive - typically intuitive and simple to use. Example clients could be professional service firms that employ video, or film studios, or marketing firms, or families wanting to reminisce and share their video and photo collections. Competitive features - LightJar is made to handle video files, in addition to photo images and audio files. A web application that works with any device having a modern browser. Subscribers can upload, access and share their saved recordings from anywhere, with any device. No native application that needs to be installed on one's computer. It has management tools to help subscribers organize and edit the metadata of their saved media assets. 20% commission on referral sales when acting as an Affiliate. Have your website banners or customer takeaways generate revenues from visitors. As an example, a website visitor clicks on a LightJar banner on your website, is taken to a LightJar landing page that contains your Affiliate Code in the landing page's URL, and decides to subscribe to a 250GB Archive Plan for backing up 125,000 photos or 150 hrs of video for an annual subscription fee of $60. You make $12 commission for each year the customer continues to subscribe to LightJar. A good service vehicle to extend your own company's business ecosystem - to share files, collaborate with customers to quickly complete projects, and save your hard work. Add-on sales to media conversion purchases; customers convert their media library, and receive it back on DVD and a second copy in LightJar to play, organize, and share. Faster turnaround on film to DVD, we returned an ISO image to the reseller, and they burned the DVD locally. A Reseller controls the sale to the end customer, buying an annual subscription to LightJar at a wholesale rate, marking up the price, and possibly bundling LightJar in with other products and services for a complete solution. The end customer pays the Reseller for LightJar, and the Reseller pays the supplier (LightJar) a wholesale rate for the service. In the sales' process, it is the Reseller that influences the customer's mindset, and it is the Reseller that delivers the value of a solution. Additional considerations for the Reseller - we program into the LightJar application the Reseller's company name and website link so that the subscriber continues to see the Reseller's name when using LightJar, and can return to the Reseller's website with a single click. As currently set up, we do not offer multi-year subscriptions. When a subscriber renews their LightJar subscription, we pay a 15% commission via PayPal to the Reseller, and continue to do so for as long as the subscriber keeps LightJar. If not already a Reseller, contact us at 800-325-9541 or email us at sales@lightjar.com, or go to reseller registration. We will review how things work with you, and if in agreement, establish your company as a Reseller of our services. We will assign your company a LightJar Affiliate Code, agree upon your company name and landing page link for when customers want to visit your services' page from within LightJar, and we will provide secure log-in credentials to our reseller website. Payments - all LightJar subscriptions are purchased via credit card, so you will need to update your account information with a saved credit card. Once entered in the reseller website, the credit card information is no longer visible to us, and is protected by TrustGuard. For Resellers with existing payment terms, we will honor these terms for LightJar, as well. After logging into the Reseller website. Select the LightJar Cloud Storage category. You will need to be logged as a reseller in order to see the correct products and wholesale discounts for any estimates or purchases. Choose the appropriate service for your customer - ACTIVE for 24x7 immediate access to all stored items; ARCHIVED for long term backup and delayed restoration; and MANAGED for a combination service. In terms of pricing the Active plans are the most expensive, and Archived plans the least expensive. Select a plan, and enter all the requested information about your customer. After your order is submitted you will receive a confirmation email and order number. Based upon your order's information, we will establish the LightJar account for your customer within 24 hours, and email you the customer's login id and temporary password for LightJar. When the order is completed, we will charge the credit card on file. The customer will be able to begin using their LightJar subscription immediately. Upon first login, the customer sees a message informing them there is a short how-to-use-LightJar video for their review, and where it is located in the User Support Center if they do not wish to watch it at that time. LightJar's support team is responsible for handling your customers' questions and support needs. We have an online support center with video overviews on how to use the LightJar service, as well as, sample questions and their answers to the most frequent questions. Subscribers have access to us via a Chat service, and affiliates are always welcome to call us on 800-325-9541. However, if a Reseller or Affiliate is promoting LightJar, then it would be good if they knew the product as well; both to help sell it and answer basic questions. The LightJar Support Center, located in the bottom footer of the LightJar application, provides information on how to use LightJar, and we are continuing to add more information to this portal based upon customer feedback. We have a 24x7 chat line for LightJar, as well as, tools for viewing the subscriber's screen and controlling their cursor. To help with getting resellers and affiliates introduced to LightJar, we offer a 30% discount off any subscription plan purchased by the reseller or affiliate for their own use. Your unique Affiliate Code - we use the code in the following ways: 1) program the LightJar application to show your company name, and link the company name back to your website; 2) auto-populate the Affiliate Code entry box during subscriber sign-up so that you are credited commissions during initial sign-up and subsequent renewals; 3) embed this affiliate code in URL links associated with online marketing materials, so that potential subscribers are directed to LightJar landing pages associated with your company; and 4) use the Affiliate Code to associate visitors that do not buy on the initial visit to LightJar as potential leads associated with your company, and if they buy in the future, your company receives the 20% commission referral fee. Marketing Items - banners, sample email letters, blog posts, content for social websites, postcards, URL links, etc. HTML content and links are unique to your company. Tracking Commissions Dashboard - what had been sold, how much commission is owed, and how much commission has been paid. How is Commission Paid? Answer - Via PayPal. You need to update your account in the Affiliate Website to show your PayPal email address. There are no service fees deducted by PayPal when paying commission. Commission is paid at the end of each month.